Top deficiencies lacking from our daily diets and how to eat your way to healthy. The following is a brief overview of the most commonly deficient nutrients and information about how each deficiency is affecting people in our country. The top 5 clinically important deficiencies listed below are ranked in an order approximately reflecting magnitude of benefit if they were to be corrected. An important point to observe is that the top five deficiencies cannot be remedied by simply adding a multivitamin. 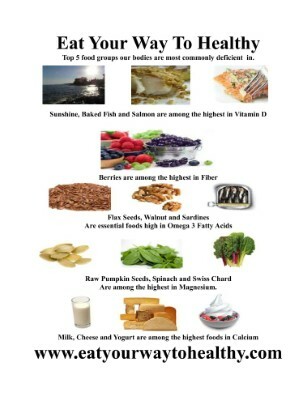 Importance of Vitamins and Minerals Top five deficiencies our bodies lack daily. The importance of daily water intake. List of Vitamins and Minerals and their roles. Starting your day with healthy foods Coffee, Tea and Juice Starting with the most important meal of the day- Delicious brunch recipes tips and suggestions. Healthy snacking between meals- Abundant snacks for any cravings The Power of Raw Vegetables Vegetable Dip and Veggie Health Benefits. How to detox Aluminum from your Body!